With Valentine’s day coming up, I thought it would be fun to look at some great pink furniture makeovers. I always love gaining inspiration and thinking about my next project. I love pink, but I know it can be a tricky color to work into your decor. 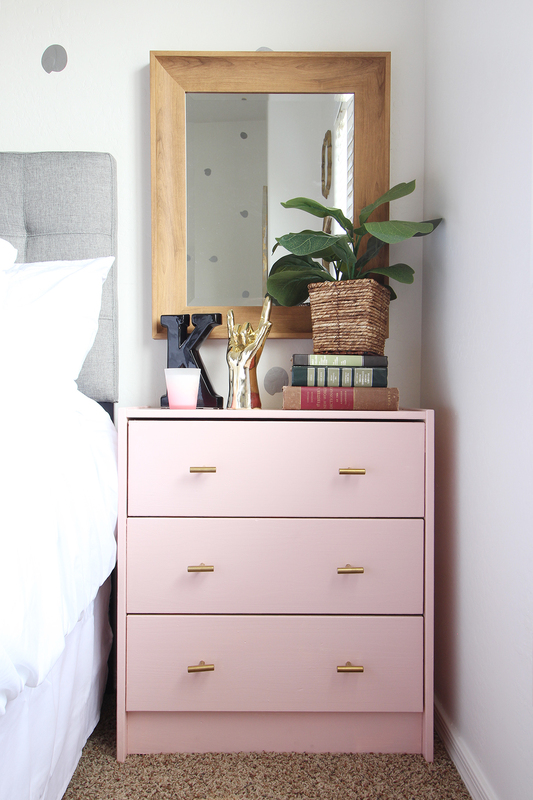 If you’re on the fence about painting your next piece of furniture pink, here are lots of furniture makeovers you can use for inspiration. Most of these pink furniture makeovers use some form of chalk paint. This type of paint gives that perfect rustic farmhouse look. There are so many types of paint now that you can easily create any of these looks for yourself. 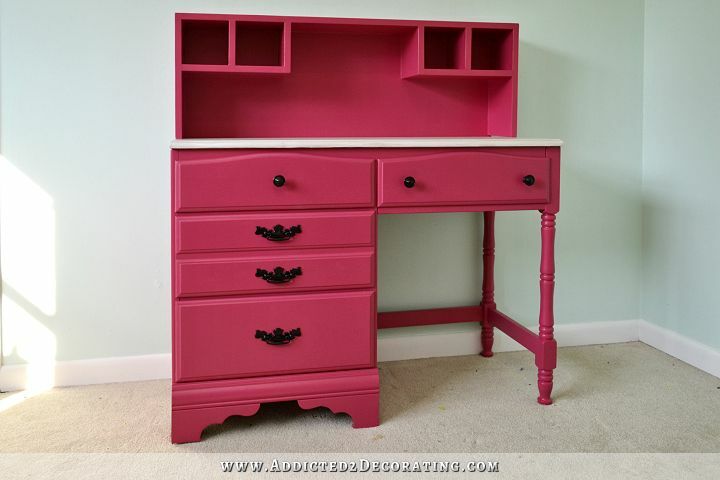 This amazing pink dresser make over cones courtesy of Classy Clutter. It’s amazing how some paint and new hardware can change the look of a plain dresser to just about any style you want! I love this pale pink cabinet makeover from Kristi at Making It In The Mountains. She used Country Chic chalk paint to change this cabinet from white to this soft and pretty pink. This next dresser is an amazing transformation. Danielle from Finding Silver Pennies removed layers and layers of paint from the original piece with paint stripper. Then she used two colors of Annie Sloan chalk paint, and a stencil to create a beautiful lace detail. 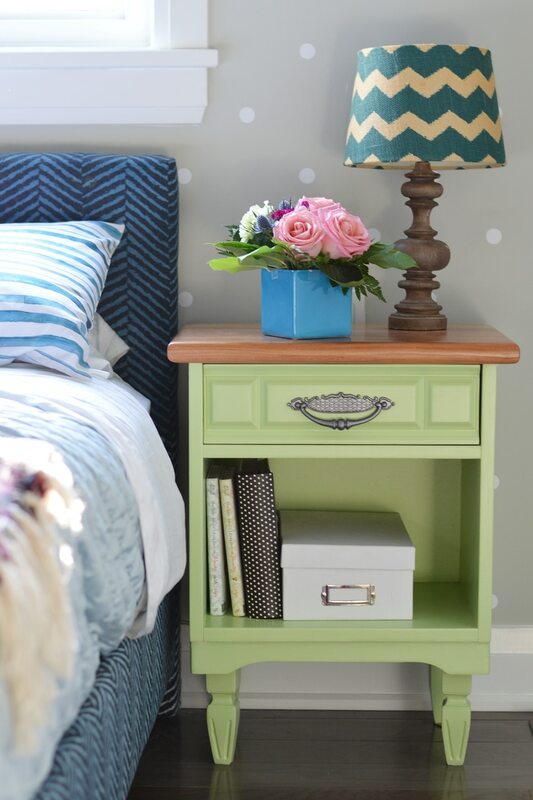 Ella Claire Inspired shows this great vintage dresser makeover. She used a pale pink from Sherwin Williams, lightly distressed it, and used a mix of crystal knobs and the original brass hardware. The distressed paint really brings out the beautiful vintage wood details. 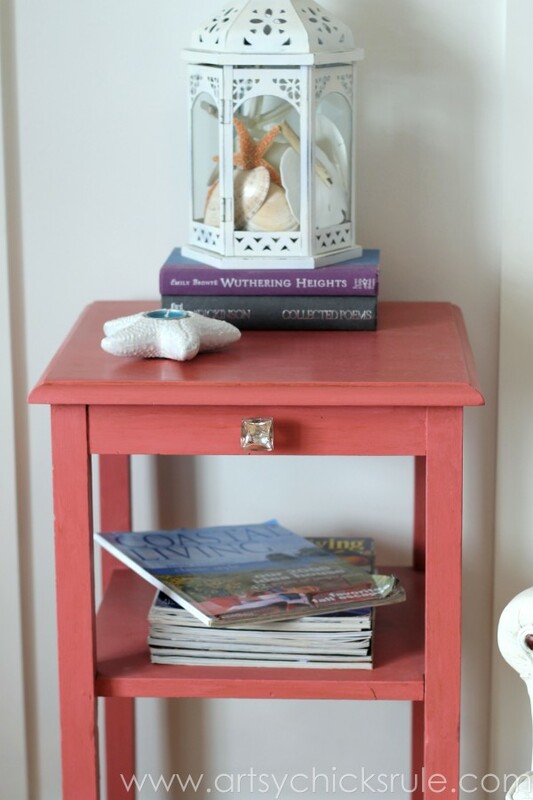 Nancy from Artsy Chicks Rule uses a mix of Annie Sloan chalk paint to turn a black side table into this cute coral color. She adds a mercury glass knob to complete the transformation. This one is my favorite. I love the curvy details on the legs, and the pink/coral color is just perfect. 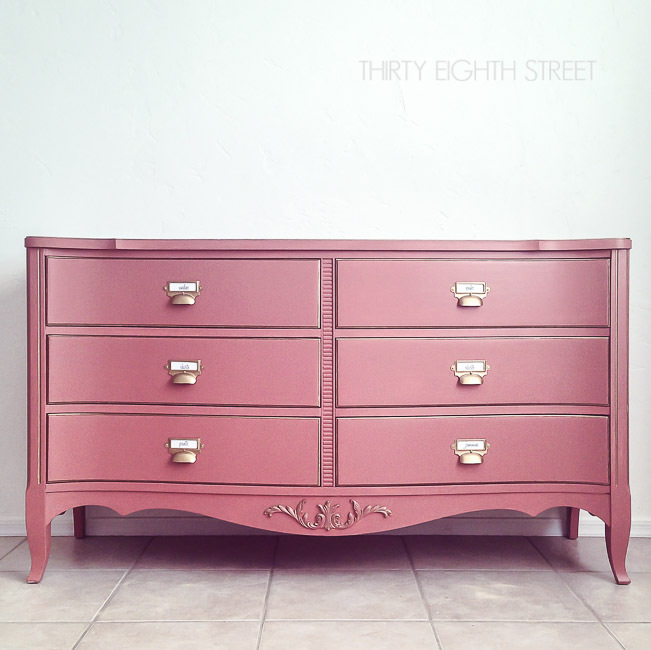 Thirty Eighth Street uses Annie Sloan Scandinavian pink, and uses General Finishes high performance for the top coat. She finished it with gold card catalog hardware. You should check the original post for the contrasting black and white drawer liners, it’s so pretty! Vicki and Amy from Canary Street Crafts use Annie Sloan chalk paint to makeover this sweet vanity. They used Henrietta, which is is a pale soft pink, then used a wash of Old White to create and even softer color. I actually have this same vanity sitting in my crawlspace, just waiting for me to fix it and paint it. I love a nice bold pink too. Kristi from Addicted 2 Decorating primed and painted this vintage desk with Behr Glamorous. Then she built an extra hutch on top for extra storage. I have never painted upholstery before, but Shannon from Fox Hollow Cottage shares some great insight about painting velvet. 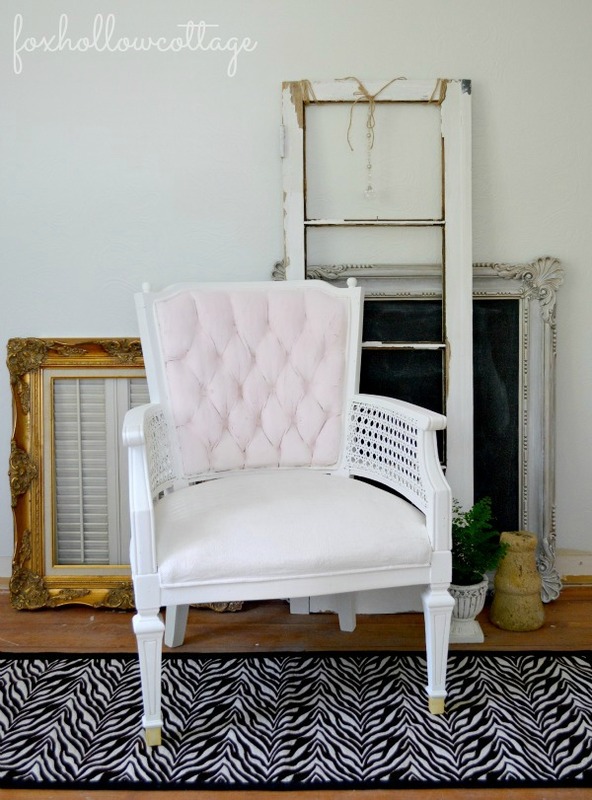 She started with an old outdated wicker armchair, and ended up with this shabby chic painted chair. And lastly, I made over this second hand side table by first refinishing the top with a dark stain. Then I painted the rest of the table with Valspar Chalky finish paint in the color Yards of Tulle. Thanks for reading! Please check out some of these posts for the full details of all of these pink furniture makeovers. If you want more furniture inspiration, check out some of my favorite makeovers below. Vintage Kissing Booth Art Print Free for You to Download! I painted a dresser for my daughter’s room a pale pink with chalk paint and just the wood grain in it turned white so it looks naturally distressed. I adore it. I’m sure that’s very pretty!